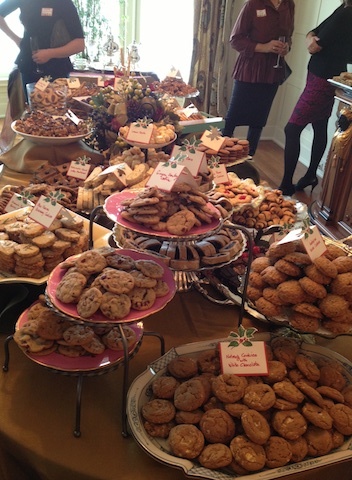 This weekend was my friend Meme’s annual Holiday Cookie Exchange and it was as lovely as ever. This is always quite the to-do, with more than a few pastry chefs in attendance so you know the offerings will be pretty good, but it’s also important to show well. I mean, these are my peers. I can’t show up with a crap cookie. The horror. In years past, I’ve made ridiculous cookies. Last year I carefully candied thin kumquat slices to top buttery sable cookies. It took a million hours and was beyond ridiculous but they were beautiful and rather delicious. 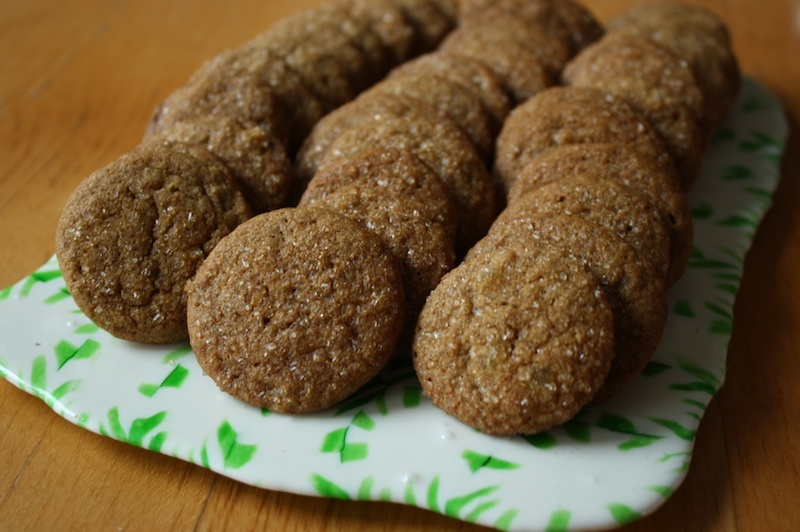 This year, I knew my cookies were good, very good in fact, (I made these) and holiday appropriate with a really great ginger bite, but they were rather plain looking. Even I was underwhelmed. So that morning, I decided to up the ante and get crafty. 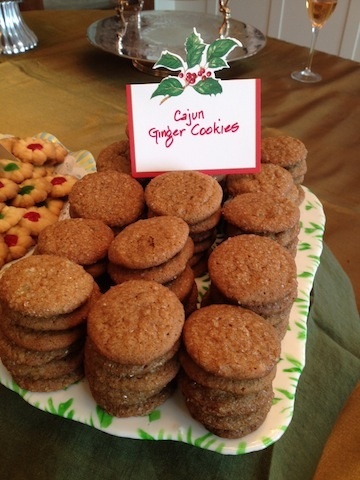 I would make the platter upon which these cookies would rest. Yep. I made a platter. While searching gingerbread ideas a few weeks back, I came across a great idea for a cookie platter that involved melting peppermint candies into a big square. 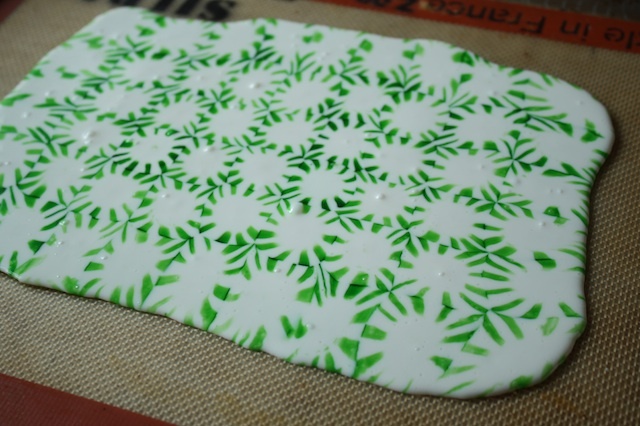 It looked great and seemed rather simple so I dug around my giant tubs of stale gingerbread decorating supplies and came up with 2 bags of green peppermint candies from the dollar store. Bingo. The hardest part of this project is unwrapping the candy. True story. 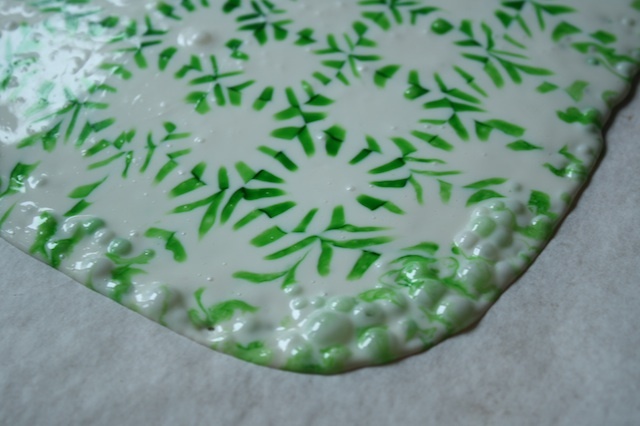 Then you simply arrange them on parchment or one of those silicone pan liners (aka Silpat mats) and bake just until the candies melt together evenly. The key is to catch it when the melt is even but before the edges begin to bubble and overcook. I blew the first one by going about a minute too long. Whoops. The baking time will vary a bit based on how thick your sheet pan is, whether you’re using a silpat or parchment (the silpat takes a little longer) and I have a gut feeling on the quality of your candy. Dollar store candy is a little lower in quality than the good stuff so I think it melts a little unevenly. I haven’t tested this theory however so it’s just a feeling I have. But set the timer early and check it often. This little project has a few challenges that can be easily overcome. Mine came out of the oven a little wonky on the sides due to a slight jostle as I was placing the sheet in the oven. Take a bit of care when transferring and yours will probably be more squared off. I saw that someone baked this in a cake pan, which is a great idea if you have the type with the removable bottom (line with a parchment round). The original source mentioned these things can be delicate so I hot glue gunned a little foamcore on the backside for additional support, which I recommend as it also acts as a bit of a riser off the table surface. I was also surprised at how slick the surface was – shingled cookies tended to slide off and I found that stacking worked better. I’m also not sure how long these will hold up but as long as you keep them nice and dry, probably a while. Maybe a good coat of shellac would help too. STRESS BAKING THERAPY FACTOR: PRETTY DANG GOOD. Surrounded by fancy pants cookies from supremely talented bakers, professional and non, this silly platter that cost me 99 cents and took 10 minutes was the runaway hit of the party. It’s cute, functional and looks fantastic on the holiday table. Score one for the crafty girl! You know what’s also great? I didn’t have to lug a heavy platter back home and my host was thrilled to keep it for her holiday entertaining. Well all right! Well worth the trip to the dollar store. I think I need to make a few more, some red, some green, some round, some square. I have a lot of unwrapping to do. 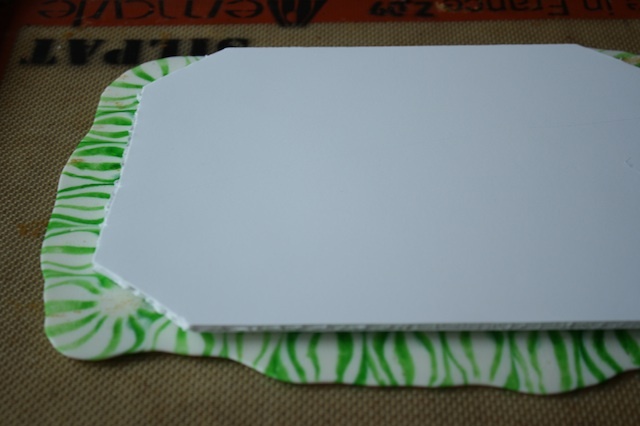 Preheat the oven to 350°F and line the sheet pan with the Silpat mat or parchment. 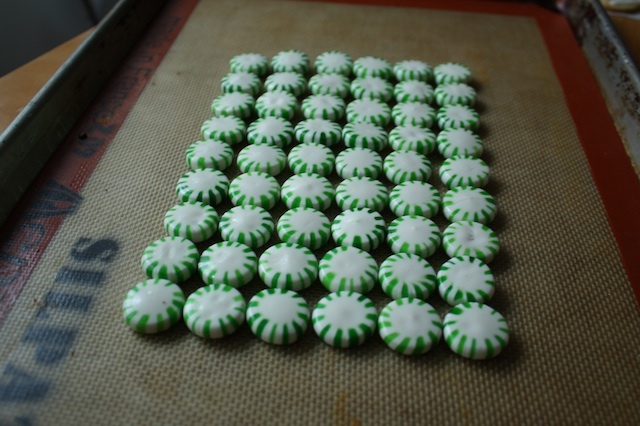 Arrange the unwrapped peppermints on the prepared sheet pan in whatever formation you desire. Place the candies snugly and evenly, side by side. Carefully place the sheet pan in the preheated oven and set the timer for 5 minutes. Check it – you want to remove the pan right when the candies melt evenly but before the edges start bubbling. If it needs more time, set the timer for 1 minute increments until it’s right where you want it. Remove from the oven and let cool, at least 5 minutes. At this point the candy “platter” can be carefully removed from the parchment/silpat but is a bit delicate. I recommend hot gluing a piece of foamcore to the bottom for additional support. What a great idea! And green starbrites are by far superior to the red ones! how long does it take the platter to set up? i ask because i was thinking… if the edges could be molded upwards, there’s no problem with the slide factor. what do you think? thanks!